There’s a surprisingly long list of flowers that are edible. I’ve used culinary lavender in ice cream, lemonade, and shortbread cookies. It adds a lightly floral taste, very subtle. Calendula flowers add a spicy and peppery flavor, a bit like saffron. And of course chamomile petals can be used to make a tea that has an apple flavor. One important thing about eating edible flowers is that you have to be knowledgeable about the flowers that you’re picking. Not all flowers are edible. You also want to make sure that the flowers haven’t been sprayed with insecticides of any sort. Finally, as Kami mentions, make sure that your dogs and cats haven’t been hanging around the flowers you plan to eat. I was excited to see this article by Kami. 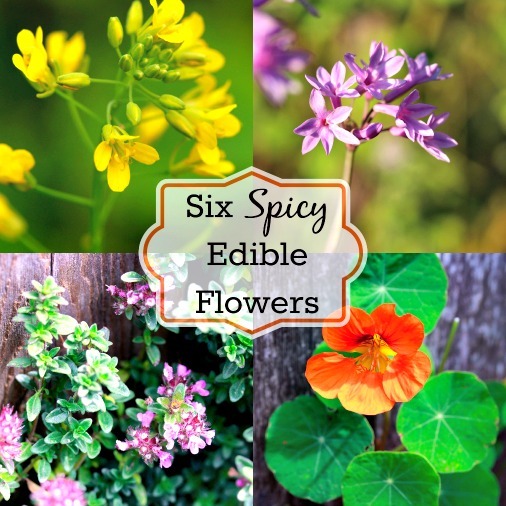 She shares 6 spicy, edible flowers that she uses to garnish food. In addition to the unique taste each flower adds, there is also the added benefit of the beautiful colors of the flower petals. She also includes the medicinal benefits of most of the flowers. When to decorate your food with the flowers. A flower with a spicy, lemony taste that’s the perfect garnish for savory dishes, soups, rice, quinoa and millet. 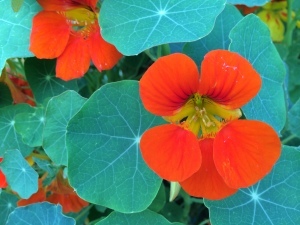 A flower with a spicy, peppery taste that can be used to garnish savory dishes or salads. They can also be used in sandwiches in place of lettuce. A flower that can be used as a spicy garnish for salads, sandwiches, spring rolls, and sandwich wraps. A flower that can be used on savory breads, potato dishes, and creamed soups. A spicy flower that’s a perfect addition to salads, egg dishes, and rice or quinoa. A hot and spicy flower that can be used in butter sauces over corn, vegetables, bread, sandwiches, and burgers. Click on the Decorate Your Food with Six Spicy Edible Flowers link below to read this creative and informative article.